You pay for the mould tool insert only. We keep the bolster serviced and in excellent working order. When you need your plastic parts, we fit your mould tool insert into our bolster fast to meet your supply needs. We have standard bolsters to fit our machines ranging from 25 tonnes to 180 tonnes, which take plastic mould tools from 100 mm wide up to 300 mm wide, making products from 1mm2 up to 300mm2. 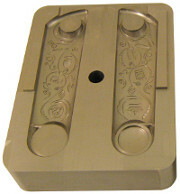 An Insert only mould tool means that you only pay for and own the tool insert. If you should decide later on to get another company to make the mouldings for you, you'll need to pay us or them to make an outer tool bolster to accept your cavity & core tool insert. We came to Toolcraft with a very urgent requirement for an injection moulded endcap. Toolcraft quickly supplied an economical quote for one of their insert-only injection mould tools, with a lead time of 5 weeks to get the samples. We placed the order just as they were about to have their annual shutdown for a week, but despite this, we had moulding samples within 3 weeks and the full batch of quality injection moulded parts within 4. What a great service. Our other plastic mould tool options include: aluminium alloy mould tools, chinese mould tools and steel mould tools. Why come to Toolcraft For your plastic mould tools ? Our tool design+manufacture software can import a vast array of file types to eliminate some design and production time normally required. This way we can offer you rapid production of plastic mould tools at much lower cost, saving you time & money. Our machining software calculates the optimum toolpaths needed to make the tool. It also stops cutters from machining areas cleared by previous ones. This means we'll make your injection mould tools in less time. Our mould flow analysing software shows us in detail where air trapment and hotspots might arise, where the weld lines will be and much more. This means we can catch those issues before they ever arise, saving time & cost again. We include this service for free with orders for plastic mould tools. Ready to get excellent plastic mould tools at great prices ? Get a Quote !